It's a long-held myth that credit cards are the source of all evil because they nurture the inner shopaholic and help us incur debt. However, used responsibly, credit cards can actually be very helpful. To me, the biggest benefit of a credit card is having the ability to pay in installments for quality items that I could not otherwise afford. I'm not saying that a credit card should be used as a free ticket to buy everything you can't afford to pay for outright. That's a sure way into debt. But everyone has something special to them that is worth the interest payments. Credit cards also have benefits aside from short-term gratification. 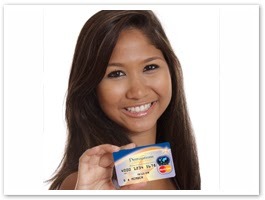 In the long term, credit cards can help build credit history and raise credit scores. Of course, that's only if you make your payments on time and DON'T charge up to the maximum limit. Having a good credit history will enable you to qualify for important loans in the future. After all, who would risk lending money to someone who never had a credit card or pattern of on-time payment behaviors in his life? In responsible hands, the credit card can serve as a symbol of growing up. A good credit history can enable you to take out a future business loan if you choose to go into business for yourself, or help you obtain a good mortgage loan on the home that you'll get to enjoy with your family. Though credit cards have both short- and long-term benefits, they need to be handled carefully. Everyone should have a budgeting plan for their credit card payments. Mine is a little trick I call the "debit-credit card." I separate one-third of the money in my account and use that as my self-imposed credit limit. Once I've passed that limit, I don't allow myself to use the credit card anymore during that month. I also separate a portion of my income to pay for the installments. It's true that if you use credit cards you'll end up with a significantly smaller amount of your salary every month, since you are going to need to spend some of your income on credit card payments. Still, credit cards give you a flexibility you couldn't get from cash. In case of any emergency, credit cards will be the first to help! So here's my advice: Do own a credit card. And if you're not completely certain that you can clear the balance each month, stick to the debit-credit card rule! Thanks for the information. If you want to make your life in college easier, use this website http://paidpaper.net/essay-help/ for writing tasks. It will save a lot of time.